Below is an excerpt from my book, On Our Own in Jerusalem. The book will be available for purchase at my book signing on Saturday at Mardels. A tiny old lady sits in the chair next to me. I recognize her as the lady asking for alms when we first came in the building. 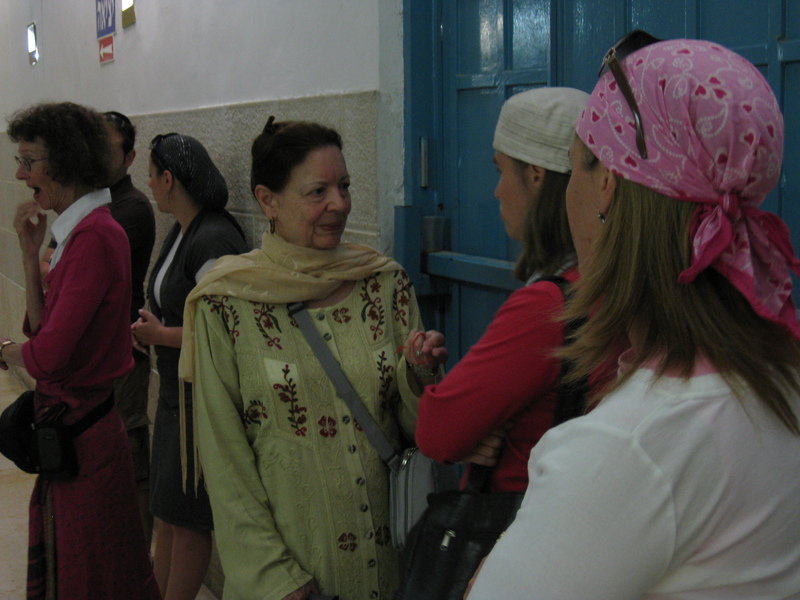 I ignored her then, hardened by people asking for shekels or trying to force us to go into their shops in the Old City. Now I feel the Lord drawing me to her. My Spirit tells me to give her something. But, Lord, I think, I only have 20 shekel bills. I hear Him say in my heart, So? I slip the folded bill into her tiny hand. She smiles and gives me a red string. I don’t know what this means. I don’t know what to do with it. We sit in a quiet and sacred place. She doesn’t speak English. Talking can’t happen. I can tell by her smile and sparkling eyes, it means something good. She takes the string and ties it around my wrist, then blows me a kiss and kisses my hand. She keeps patting my hand, then, gives me another red string. She mouths some unrecognizable words and gestures. She wants me to give the other string to David. Out in the hall I ask our guide about the lady. Sarah reminds me that since Biblical times the government has allowed the poor to ask for alms in certain holy sites. In return for those alms they bless you. The red string tells everyone you have received their blessing for peace and good luck. More importantly, it reminds the wearer of God’s generous nature and the blessings they received from Him enabling them to share with others. [Although the Hebrew word for charity is Tzedakah, it has an expanded meaning for Jews. It means righteousness, justice, fairness. Giving to the poor is not viewed as a generous, magnanimous act. It is an act of justice, giving the poor their due.] A woman standing near me says, “Look, my mother gave me one before she died.” She holds up her wrist. She shows a silver bracelet with red string running through it. I tie the other string around David’s wrist. 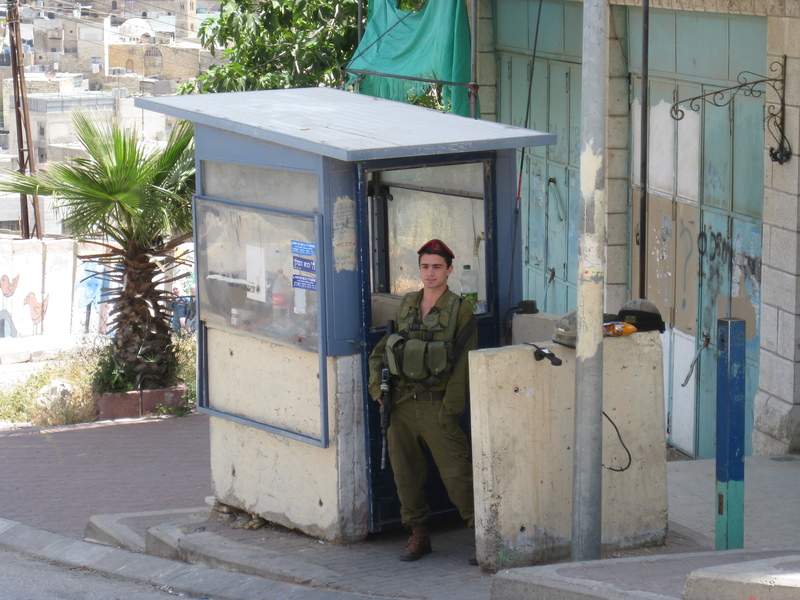 We board our bullet-proof bus, go through the heavily armed and guarded checkpoint, and turn toward Hebron. The road to Hebron takes us through the hills of Judea. Before we get there, we must pass the Palestinian city of Bethlehem. In 1998 and 1999, I got to go to Bethlehem. Both times I went to Nativity Square and the Church of the Nativity. Later, in April, 2002, Palestinian gunmen took over the church and held hostages for 38 days. Seven Palestinians died in the confrontation. Because of this history, and the Hamas presence, guides tell us not to travel in Bethlehem. The Israelis solved the problem of traveling through Bethlehem by building a tunnel under the city. We go underground and come out into the Judean hillside. A carpet of green covers hills dotted with fruit trees and vineyards. Ancient rock retaining walls support terraced fields. Some of the world’s finest wines come out of these vineyards. You can probably buy it at your local liquor store. The countryside gives way to concrete walls, for safety’s sake. These walls suddenly disappear as we roll down a steep incline, through a narrow street, into Hebron.